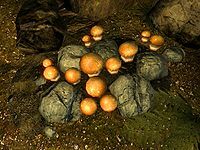 Imp Stool is a fungus found in caves. It tends to be situated near the edges where wall and floor meet. The base magnitude of the Restore Health effect for this ingredient is 3 instead of 5. This is only relevant if blisterwort and imp stool are combined, in which case the resulting potion will have a 40% smaller magnitude than a typical custom Restore Health potion. This page was last modified on 3 June 2018, at 17:54.